We say we love God’s Word, but how can you love something you don’t actually know? And why are so many Christians illiterate when it comes to scripture? According to a 2000 Gallup poll, “59% of Americans reported that they read the Bible at least occasionally. This is down from 73% in the 1980s. The percentage of Americans who read the Bible at least once a week is 37%. This is down slightly from 40% in 1990. According to the Barna Research Group, those who read the Bible regularly spend about 52 minutes a week in the scriptures”. Scary, isn’t it? So why are so many believers Biblically illiterate? There are a few reasons, I think. One of which is that Christians do not know how to read the Bible. I think many believers pick up the Bible, open it up and attempt to read because they know they need to. However, they lack the empowerment of the Holy Spirit to admonish, convict, and teach them. They also lack the knowledge and instruction on how to, not only read, but also absorb, retain, and then apply scripture to their daily lives. Bible reading has become the religious equivalent of sound-bite journalism. When people read from the Bible they typically open it, read a brief passage without much regard for the context, and consider the primary thought or feeling that the passage provided. If they are comfortable with it, they accept it; otherwise, they deem it interesting but irrelevant to their life, and move on. There is shockingly little growth evident in people’s understanding of the fundamental themes of the scriptures and amazingly little interest in deepening their knowledge and application of biblical principles. A second reason that many Christians are Biblically illiterate is simply that many churches today de-emphasize the need to thoroughly teach the scriptures. Between the commercialization of Christianity and prosperity teachings, many Sunday services are watered down, “seeker-friendly” versions of the scriptures. Perhaps the thing I find most disconcerting is that millions of people have Bibles–they sit on their shelves gathering dust, or next to a bedside, never opened. Satan doesn’t care that people own Bibles. He doesn’t even care if people open them up and read them from time to time. He does care, however, if those scriptures are understood, memorized, and applied. It is like sending a solider off to battle with a loaded weapon that they do not know how to shoot. It looks official. It looks dangerous, but when it is time to defend ourselves or shoot our enemy, we realize we have no idea how to fire. Satan has helped create an army of impotent soldiers. I am the first to admit that I am no Biblical scholar. I am often frustrated at the amount (or lack thereof) of scripture I actually know. I always pull one of these, “You know that verse, that’s like, ‘such and such’. I don’t know where it is in the Bible, but it’s in there.” I desperately desire to be able to recall verses and their references at the drop of a hat. However, I have had the fortune of learning how to study the Bible, so that I am not just reading , but retaining. I also depend on the Spirit to illuminate God’s Word. I do not need to go into a long speech about why we need to read the Bible. It is our bread and love story. It is a message to all of humanity and God’s very own words to His beloved children. 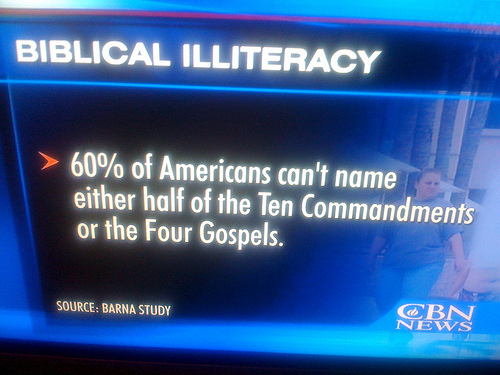 It seems, though, that the threat of Biblical illiteracy is very much alive in the American Church. Church leaders and individual believers are responsible for teaching and understanding the Bible. We will sacrifice more and more soldiers if we do not teach them how to effectively fire their most powerful weapon. How are you doing in the Biblical literacy department? Do you see Biblical illiteracy as a problem in your own church or community? How do you think we can best combat this epidemic? Then after going to Bible study and taking classes such as Beth Moore Proverbs ;) Where we READ the Bible as well……. all the sudden this same book I had tried to read to gain wisdom SO many times just spoke to me… and the more of the Bible I read the more I understand it. I just love knowing that nothing can do that but the power of the spirit. The same passages that would confuse and frustrate me because I found it hard to understand or remember take on life and meaning. I have to admit… lately I once again have been at a point where I am not quite sure which book to read or where to go… but this time it’s lack of direction and too many things I want to absorb vs frustration with it not being easy to understand. So for me, it wasn’t necessarily that I wanted the words to be what I wanted… it was more just wanting to know what God wanted me to understand and know and finding it difficult. I still find this is easier for me in a Bible Study with some direction. Thanks for the Post miss Nicole….. That motivates me to go get my Bible right now! Which was on my agenda this morning but as you can see I am currently distracted…..
Jen, I love your comment! It makes me smile! Isn’t it amazing how our Godly wisdom can grow when we are empowered by the Spirit and we gain some simple instruction? Beth Moore is a great example because she really does teach us how to examine God’s Word and critically understand the text. She also gives the Spirit room to teach and lead, as well. I’m so encouraged to know how your reading and understanding of the Bible has grown and that you are no longer frustrated, only encouraged. God rocks and I wish more believers had stories similar to yours! p.s. one of my favorite Pastor Jamie lines is… this is Scottsdale Bible Church where we bring our Bible’s and let’s turn to……. and see what God’s word has to say to us today. I want to add to that that many churches today de-emphasize the need to teach HOW to study the Bible. Luckily, people like Beth Moore and especially Kay Arthur have led the way in teaching how to study. Spiros Zodhiates’ word study books are a great tool that I use. It uses the Strong’s numbering. Zodhiates goes into a lot more detail about the meaning of the word than Strongs does. So yes, I think churches teaching HOW goes hand-in-hand with the individual believer taking responsibility and learning how on their own, as well. I love Kay Arthur’s How to Study Your Bible and have passed it on to many people. It is so practical and eye-opening. Thanks for the comment Cecily! My Bible knowledge isn’t the best it could be, but I’d also say that it’s a bit better than average. I did a lot of Bible study in college with InterVarsity Christian Fellowship, and led Bible studies at my church in the US. In the past few years, because of where I’m living now, I haven’t had much chance to get fed in the same way I used to be–I’ve had to do a lot of self-feeding, which also means I haven’t been studying like I used to. However, my gf and I have been reading the scriptures more, and we’re trying to start a study of Mark that I think will be helpful for both of us. I could go into a rant, but I won’t…but let me just say that I agree with you about the “American Church” and the focus of its worship services. While I’m not saying we need to return to hour-long preaching sessions about a single set of verses in the Bible, I do think there needs to be more of a focus on what the scriptures say and what they mean. I like the way the liturgy has developed over the past 2,000 years in the Orthodox Church, where scripture and teaching are woven into the daily prayers and church liturgy. If you couldn’t read, or didn’t know how to get a Bible, if you learned the liturgy and prayers, you would know a great deal. I like this, and think this incorporation is the way to go. But that’s perhaps another story. I think we all go through seasons in Biblical knowledge and growth. I had a huge Bible knowledge surge in college and since then it has been more gradual and bit by bit. Every once in a while though, when the Lord is really trying to impress something upon me, the Word just opens up in new ways. I am so interested in the idea of the way in which the Orthodox Church incorporates prayer and church liturgy into every day life…and more so, how that can, like you said, encourage more understanding and memorization of the Word. I don’t know enough to really comment, but I think it is a potentially great idea. Thanks Josh….now go read the Word! the Holy Spirit was the One who inspired people to write the bible… and He is the only One who can give divine revelation and inspiration when we read it. too many people read the Word without asking Him for divine wisdom. instead we rely on our human knowledge and base it on feelings, experiences and our “terms of theology”. reading the Word becomes a dead experience instead of an exciting one. the answer for biblical illiteracy: fall in love with the One who wrote the Word for you. rely solely on the Holy Spirit to bring divine revelation. then you wont be able to get enough of Him and His Word. Patricia, you just gave the bomb answer! I love it! One thing though, is I think many believers don’t even know how to listen to or be led by the spirit…which is a whole ‘nother topic. At any rate, I totally agree with you. It is the Lord who brings us understanding and revelation. And it is He who also empowers us to apply these truths to our lives. 2. On our own, the bible is “homework,” but who likes homework? I don’t know how to read this thing anyway. 3. We feel like we’re getting enough, because someone held the “G” key down on the Korg Triton, set to “Mideval Fairy Fantasy” during the entire 3 minute prayer session. Also, the lights were lowered. There, we got “holy” enough for the week now didn’t we? Oh Joey, you share my heart in this area. you bring up so many things here that I care about and dislike in the standard Sunday service (and the way we “do church” in general). I will just say, that yes, the American church structure is not always compatible with learning and applying Biblical truths. If the body is meant to edify the saints, well then, Sunday service falls a little short. But thankfully, more and more folks are beginning to realize that a 10:00 a.m. 90 minutes service is not church. I think calling Bible reading “homework” is a great analogy. Many probably do feel that way. It becomes monotonous, boring, busy work…stuff we do because we thinkshould not because we want to. Anyway, there is a whole ‘nother post in your comment alone. Did you ever read my old post about house churches vs. Sunday service? It was on my old Tumblr blog, but I addressed many of those things. You bring up great points here. Some compromises have to be made by all parties to fix this problem. First, one of the challenges of churches is to present the Gospel in a absorbable way to people at different levels in their relationship to God. This is challenging enough. What’s worse, is that you generally have about 90 minutes to present your congregation with a well-rounded approach to a relationship to God. That is, you need to exhibit a love for God with heart (often worship), soul (sound teaching and prayer), mind (often preaching) and strength (areas for serving, both in service and beyond). The reason you have only 90 minutes, is people don’t want to come during week to a bible study (where they can learn how to read, remember, and apply God’s word.) Today’s christian audiences what full meal benefits from appetizer portions. This, my friends, will not do. This is why you have a sensory approach to Sunday Morning. Not to show off your HD TV, but to draw people into an experience they will remember. So while I agree biblical literacy is a problem, I think we should stop short dishing one-sided blame. Thanks for the topic Nicole! I’m liking your site. I have a blog covering a similar topic posting soon, and would love to reference this page. Antwuan, you bring up some great points. I agree that one of the main issues with our Biblical illiteracy is the church structure itself. More than that, church goers have expectations that cannot be met. I love what you said: “Today’s christian audiences what full meal benefits from appetizer portions.” So true. I have a heart for home groups, small groups, discipleship, and the house church movement, more specifically, because a 90 minute Sunday service is not church. Thanks for the link love. I’ll check out that post from you too. Blessings. Hi Nicole … this is such a challenge to me and am so glad ure talking about it … for me its a thing of consistency … and I find it hard keep up with my (quote and unquote ) good intentions. its weird how everything you’ve talked about rings alarm bells to me. Anne, hey we all struggle in this area (at least most of us do). I think the word consistency is key. Being consistent makes a huge difference in our understanding and application of the Word. However, I will also say, don’t be too hard on yourself about reading every single day. I used to beat myself up if I didn’t meet my own pre-set expectations. The Lord gently showed me that He doesn’t want me to fill a quota, just to come to Him and seek time with Him. That may be in the Word some days. It may be in silence or prayer or service other days. I’m glad the Spirit is speaking to you on this subject though. We all could use a little bit of encouragement and added discipline. Blessings to you Anne. First, I really like Joey’s answers. They’re biting but so true. Now, I am a Bible idiot. Yep, I’m admitting it out loud. I have carried it, I have loved it, and I can’t understand 90% of what’s in it so I don’t read it. I don’t, and that stinks. I blame part of that on my own lack of understanding, of course, but another huge part of it on my lack of a decent church. I’ve never found a church I loved — or even liked. At this point, organized religion is nearly a cause for scorn rather than joy. I’ve been told — by a preacher, I might add — that if I didn’t submit to all things I was destroying God’s word. ALL things. Like, abuse. I get tired of being yelled at from the pulpit about tithing, or trouble within the church, or whatever else someone isn’t or is doing that should be between them and the preacher, NOT a Sunday sermon. I would hate to know what the gossipy old women would have to say about my current life circumstances, and I am BEYOND sick of people telling me it’s ok to divorce him, because *even God would not want to be with him*. Which, is crap. Yeah, it is. God made him, and he sure ain’t easy to love, but if God doesn’t want him, why else would he be alive? I wish I could find a GOOD, loving, spirit filled Bible study/church here. I think I’ll make that my Christmas wish. Maybe I’m scared of church at this point…..
Ade, I so empathize with you on the whole needing and wanting to find a church you love. I am so saddened that you have never been in a church you love. It breaks my heart. I don’t even think I would still be walking with the Lord, had it not been for the body of Christ. When people don’t read their bible, they will believe anything that sounds, “godly” but that can be a “counterfeit” doctrine. I admit, the Bible can be intimidating: where should I start? what does it mean? how does it apply? But as many folks here have mentioned, we have to approach it with the direction of the spirit. Psalm 119 gives us a glimpse at the benefits of knowing, applying, relying on God’s word. In a day where everything can be godly, not all things are. Paul commanded Timothy to be aware of those folks who taught false doctrines. The law is good if one uses it properly, Paul mentions. And this applies to God’s word. Keeping things in context, and studying to show ourselves approved is a critical step in the right direction. Too many people know God by hearsay, but not personally. Want to know God, read his Word. No other tool speaks more about God, his heart, his purpose than his Holy Word. Second, I would just like to suggest some answers to the three questions at the end. 3. By loving, zealous exhortation and encouragement, and prayer. Another thing might be to try to influence church leaders and/or liturgy makers to make public reading of the Bible a regular part of the church services. Such readings are quite powerful, when they are done with faith, passion, and – let’s not forget – understanding. It is also good scriptural practice. Next Next post: Should Christians Be Rich?